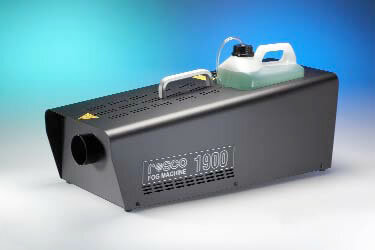 Rosco's Model 1900 fog machine is a very high output professional fog machine at an affordable price which is designed for theatrical production, clubs, opera, film, TV or anywhere a large amount of fog is needed. Built on the same principles as the Rosco 1700, the Model 1900 offers control features that today's special effects professionals demand. These include volume control to allow the user to vary the output as well as on/off timers for automatic sequencing. Up to four Model 1900 machines can be operated from a single remote by simply running a standard 3-pin XLR cable from machine to machine. This is a popular feature in clubs or other large spaces. The remote control, standard equipment for the Model 1900, is stored on the machine and comes with a 5 metre cable. An optional DMX control (the same as that used with the Model 1700) is available so that the 1900 can be easily operated from a lighting control console. The Model 1900 accepts the same standard hose adaptor and ducting hose as all other Rosco machines. But the most unique feature of the Model 1900 is the extremely high output. With an initial high burst of fog in the first minute that is 250% higher than the Model 1700, the Model 1900 will fill the largest venues with fog in a very short time. After the initial burst, the Model 1900 will scale back the fog to operate continuously without interruption for a reheat cycle. 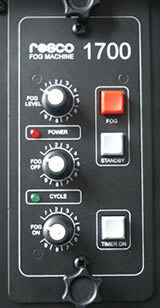 This fog volume is achieved using only 20% more power than the Model 1700. The Model 1900 is equipped with an electronic thermostat, a cast aluminum heat exchanger, and a piston pump, all for easy serviceability. In addition the heat exchanger has a resettable thermal trip for safety. The fog outlet cowling accepts the standard Rosco hose adaptor and ducting hose system. 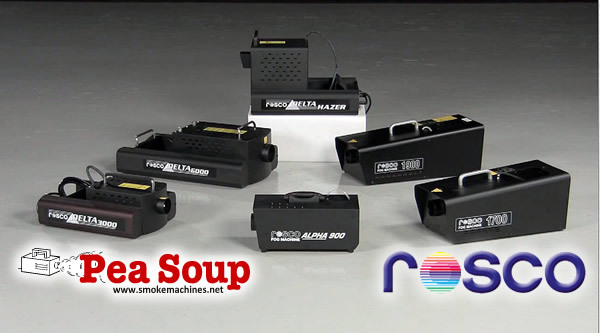 Like most Rosco fog machines, the Model 1700 can be operated with the Rosco Coldflow for low-lying chilled fog. The Rosco model 1900 accepts either the 4L or 2.5L Rosco Fog Fluid bottle (not included), which makes it accessible to the entire range of Rosco fluids. Dimensions: 22.44 in. (57cm) (L) x 9.67 in. (24.8cm) (W) x 8.5 in. (21.6cm) (H).